Audience members at the 2018 World Polio Day event in Philadelphia, Pennsylvania, USA. 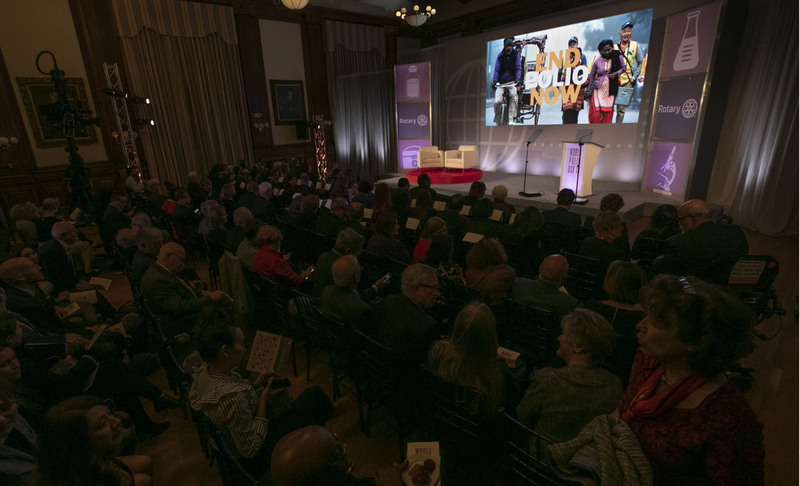 Hundreds gathered to celebrate World Polio Day at the College of Physicians of Philadelphia, Pennsylvania, USA. Cable journalists Ashleigh Banfield, right, host of HLN’s “Crime and Justice,” and Alex Witt, host of “MSNBC Live With Alex Witt,” moderated Rotary’s 6th annual World Polio Day on 24 October in Philadelphia, USA. Polio survivor John Nanni, PolioPlus chair for District 7630, attends Rotary's 6th annual World Polio Day in Philadelphia, Pennsylvania, USA.